Exposure to the world of extracurricular activities is undoubtedly one of the most exciting experiences of school life. Thus, extracurricular activities at KIMS are pursued with heightened zeal and passion. Sports are an integral part of life at KIMS and range from outdoor activities like basketball, badminton, cricket and football to indoor sports like snooker, foosball and table tennis. Apart from promoting healthy competition in inter school sports championships, these activities help students prepare for the Annual Sports Day. The event comes as a treat for every sportsman, where our young athletes and gymnasts remain the centre of everyone's attention. Trophies are awarded to all the winners in the concluding prize distribution ceremony, fostering a sense of achievement in students and providing them an opportunity to rejoice over their triumphs. The Annual KIMS Sports Fest, in which many schools participate, is always a huge success. 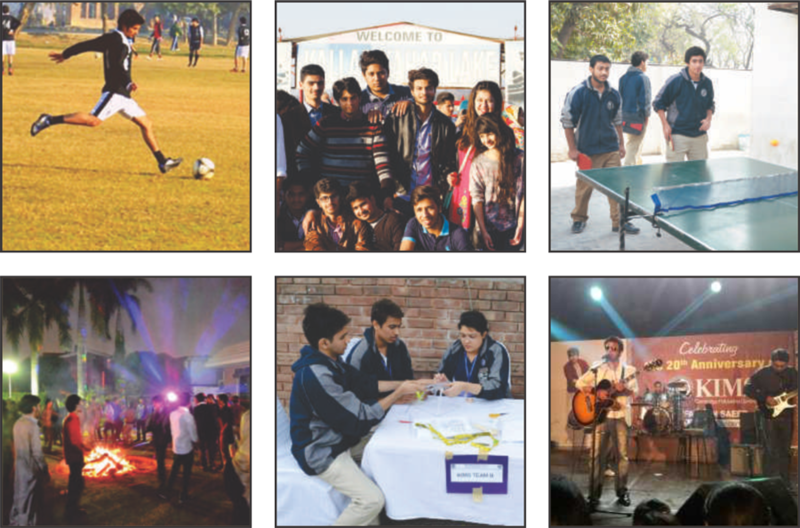 Other activities and events at KIMS include drama festivals, milaad gatherings, bonfire nights, cooking competitions, concerts, a welcome party for the first year students and a farewell party for outgoing classes. Students can unwind in our fully air-conditioned rec room with cable/dish tv (including some HD channels) and PlayStation/Xbox or work out in the school gym. The management ensures a balance between leisure activities and educational events that help our young students become well informed individuals. Guest lectures are arranged every now and then to inform students about the views of a host of renowned personalities, be they poets, philosophers, political thinkers, social workers or economists. In fact, students themselves are encouraged to develop public speaking skills by participating in plays and various intra and inter school debating competitions. Our experienced coaches provide all that our young debaters need to acquire to become eloquent speakers. It is a matter of great pride that Keynesians have always responded to debating competitions with enthusiasm and won many bilingual interschool declamation contests. We, at KIMS, believe that learning is best when induced through competition. Thus, the school staff makes every possible effort to encourage student participation in large scale annual competitions organized by prestigious universities like LUMS. Students are provided with all the facilities and guidance they require in putting their knowledge to test in such contests. Also, intra school activities like Spellathons, Readathons, Poetry Recitation and Essay Writing Competitions keep the students busy all the year round. All activities invite eager participation and attractive prizes for winners motivate students to participate in future events. The school also arranges leisure trips to various places and sometimes educational trips to old cities and historical sites in an attempt to familiarize students with their culture and heritage. Not only do such trips tickle their imagination and make them inquisitive about the past but also help develop students' aesthetics. On the other hand, leisure trips to foreign countries acquaint students with the social and cultural norms of other nations and enhance their general knowledge. Such trips are a healthy and welcome break from the hectic routine of students revolving around studies. Travelling in a group embraces a sense of sharing and trusting fellow mates, and interacting with people after stepping out of their comfort zone helps students develop well rounded personalities. Students are chaperoned by senior staff members on all trips and every possible security concern is accounted for. ORI, the annual school magazine, is an attempt to satisfy the ambitions of even the most 'junior journalists' amongst the students. ORI, a prefix literally meaning 'the rising of', duly reflects the aspiring attitude at KIMS. It also encompasses a summary of all events that have occurred throughout the year complemented by pictorial displays. With humorous titles assigned to outgoing classes, interesting language and eye catching pictures, the magazine is an utter treat for all Keynesians. Being elected for a position in the Student Council is a great achievement for any Keynesian. This privilege is not only confined to maintaining a commanding position in school but also plays a key role in substantiating students' resumes and securing admissions in renowned universities across the globe. The Head Boy and Head Girl are nominated from the pool of A Level students every year by senior faculty members. The rest of the Council comprises House Captains, President Student Council, Secretary Social Work, Secretary Sports, Secretary Dramatics, Secretary Debates, and Coordinator ORI etc. Each position has its own aura and dignity which every Keynesian aspires to possess.